We have extended the scheme whereby hedgelayers under the age of 30 can claim a £25 bursary from the NHLS when training or competing into the 2018/19 season. See the Awards page for more details. The harmful impact of urban air pollution could be combated by strategically placed hedges along roads in a built-up environment of cities instead of taller trees, a new study has found. 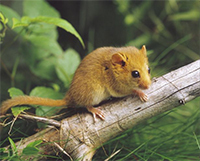 The Dormouse, one of the countries favourite mammals is an endangered species according to Ian White a spokesman for the wildlife charity People's Trust for Endangered Species, speaking on BBC Radio 4 Today programme. Britain's native dormouse has declined by more than a third since the year 2000 according to a new study by the charity. Some of this decline is due to the loss of habitat and changes in the way in which Woodlands and Hedgerows are managed. At the National Hedge Laying Society we are uniquely placed to help combat this decline with the knowledge and skill of hedge layers to managed hedgerows in a traditional way, which is wildlife friendly. So how will Brexit change Hedgelaying? It is perhaps too early to predict any precise outcomes but the indicators are already in place to suggest some major changes. The price of agricultural land has always been a good barometer of the farm economy. Recently agricultural land prices have taken a down turn and if this continues it suggest an agricultural depression is on its way. But what’s new, farmers have been on a roller coaster ride for hundreds of years. The Government has already indicated that they will continue with Pillar one (Farm Payments) after leaving the EU, although there is considerable pressure to place a cap on payments for larger holdings. No guarantees have been given regarding the environmental payments and the farming lobby is anxious to ease the regulations regarding hedgerows. It would seem that the days of substantial grants for major hedgelaying projects may be coming to an end. Nevertheless agricultural small holdings and Hobby farming is on the increase and the conservation sector remains buoyant. Regardless of the economy hedges still have to be maintained and I suspect that there will be plenty of work for the hedge trimmers and any enterprising hedgelayers willing to sell skill training. So get out there and convince the world that hedgelayers are needed. One thing is for sure, there are many twists and turns to be negotiated along the way out of Europe. Don't panic and keep in mind that modern agriculture depends on World prices, not on European or British politicians.